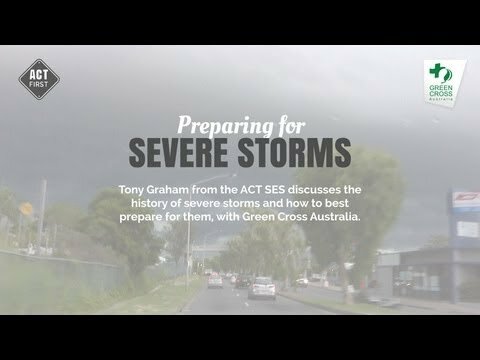 1/1 Preparing for severe storms Tony Graham talks about how you can prepare yourself for a severe storm. Severe storms are localised events, usually affecting smaller areas than tropical cyclones and floods, so their devastating impact is often under-estimated. These storms, which are more common than any other natural hazard, can occur anywhere in Australia. Each year, on average, severe storms are responsible for more damage (as measured by insurance costs) than tropical cyclones, earthquakes, floods or bushfires. Unfortunately, storms also kill people: between 5 and 10 deaths are caused by lightning strikes each year. More deaths occur when strong winds cause tree limbs to fall, debris to become projectiles and small boats in open water to capsize. Although many people believe that tornadoes do not occur in Australia, they have caused at least 41 deaths here. A severe thunderstorm is defined by the Bureau of Meteorology as one which produces; hail, diameter of 2 cm or more ($2 coin size); or wind gusts of 90 km/h or greater; or flash floods; or tornadoes, or any combination of these. Thunderstorms require 3 main ingredients; a source of moist air, an unstable atmosphere and a trigger mechanism. Moist air is important because when it condenses to form cloud, heat energy is released making the rising air more buoyant and fuelling further cloud growth. An unstable atmosphere is necessary so that developing cloud is able to rise freely to great heights in the atmosphere. Trigger mechanisms are important as they serve as a focus for storm development. Typical triggers are cold fronts, heat troughs and regions of low pressure. Hills and mountains may also enhance storm development. The severity of any subsequent thunderstorms will depend largely on the buoyancy of the rising air within the storm and the structure of the wind within the atmosphere. Wind direction and speed is rarely constant, and generally tends to increase in speed and turn anti-clockwise (in the southern hemisphere) with increasing altitude. The change in wind direction and speed as you move upwards through the atmosphere is known as "wind shear". Certain instability and wind profiles can lead to the development of long-lived thunderstorms with strong rotation within their cores. These storms are known as "Supercells" and are responsible for the majority of damage caused by severe thunderstorms. Supercell thunderstorms may produce very large hail, extraordinarily strong wind gusts, powerful tornadoes and heavy rainfall. Lightning is the discharge produced when voltage differences between ground and atmospheric electrical charge are large enough (several hundred million volts) to overcome the insulating effect of the air. Strokes can occur within the cloud, between clouds, or between clouds and the ground. Thunder is the sound produced by the explosive expansion of air heated by the lightning stroke to temperatures as high as 30,000°C. Hailstones can form in a thunderstorm with a strong updraught when frozen raindrops, suspended in the updraught, grow rapidly by sweeping up small cloud droplets which freeze on contact. Hailstones larger than cricket balls have been recorded in Australia. In a mature thunderstorm, the falling rain and hail drag the surrounding air downwards. In addition, evaporation from the raindrops cools the nearby air, accelerating the downward rush. This strong downdraught spreads out upon reaching the ground, producing a cool, gusty wind that can cause damage.